Noel is at present three years old. He is doing well and in good health. Noel hasn’t started to attend the kindergarten as he hasn’t reached the age of attendance. He spends his time playing at home with his toys and his favorite ones are car-toys he drives around the room. His future dream is to play in the football championships and be a well known player. Noel attends regularly twice a week, every Tuesday and Friday our feeding program at Katjel, enjoying the combined meals cooked and served to the participating children. He comes together with his mother to attend. Noel likes the fried chicken, sausages, pasta and rice served by our cooks. He attends the Bible classes for the children who are same age with him and enjoys singing to praise the Lord Jesus and learning from God’s Word. At the end of the Bible lesson, he and the other children spend time to color or draw at our feeding centre under the care of our teachers. He also has the possibility to gain a free dental care offered at our dental clinic in Kotodesh. 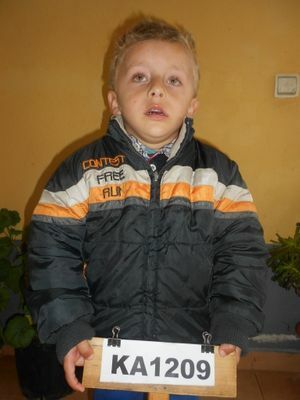 There are six persons containing Noel’s family who are his father, mother, grandmother, his sister Natasha, nine years old and his brother Klajdi. Eleven years old. They both attend our programme. This family lives in a small home containing three rooms which offers appropriated living conditions. Klajdi’s father has managed to work in emigration to provide for his family. During this year he got hired three months to collect and cultivate olives. What he earns there is less but at least a secure income. The family has land and during this year as usually the mother planted the vegetable garden in order to provide more food for the family. They also have planted corn which serves as stock food for their cow. The cow gives to them profit in sub products to be consumed daily. The grandmother who is part of this family receives a retiring village pension. This amount is too little, but at least helpful. The family manages to provide food and clothes, but they are still poor. The income is too less to cover all the expenses needed for a whole year through.